LIFELONG republican BOBBY STOREY has been involved in the struggle for well over 30 years, having been interrogated, brutalised and imprisoned for 20 years, most of which time was spent on remand. Bobby is at home in any site of republican struggle and he talks to ELLA O’DWYER about the route through that struggle which brought him to become the new chairperson of Belfast Sinn Féin. OVER six feet tall and with a commanding stature, Storey is otherwise known as ‘Big Bobby’. At first glance and considering his impressive CV, you could be forgiven for expecting a macho, self-opinionated character but, if anything, he is a bit self-effacing in relation to his contribution to the struggle. Bobby Storey makes serving time sound like no big deal and is philosophical about his 20 years in jail. From the New Lodge, in north Belfast, the Storey family had to move house when Bobby was very young. “We originally lived in a place called the Marrowbone but had to move because loyalists opened fire in the area on too many occasions. We went to live in Manor Street, in another part of north Belfast, which was an interface with a loyalist area. “I have two brothers and one sister: Seamus, who escaped from Crumlin Road Jail in 1971; Brian, who is Downs Syndrome; and Geraldine. Bobby’s father, also Bobby, along with a brother-in-law of the late Joe Cahill, Sam O’ Hanlon, were involved in the defence of Catholic homes in the area at the time. His brother, Seamus, was in the IRA. Bobby recalls that he was “about 15 the first time our house was raided in 1971” and a rifle and pistols were found. “Daddy and Seamus were arrested and taken to Girdwood Barracks and brutalised. Girdwood was a well-known torture centre. “My father was released but my brother was charged and escaped from Crumlin Road Jail a couple of months later. When he escaped our house was raided on several occasions as the Brits and the RUC were looking for him. Like so many other republican and nationalist families in Belfast, the Storeys had an innate opposition to the British presence in his city. “There was an instinctive anti-British culture and politics in our house but although there was a history of republicanism on my mother Peggy’s side the main influences on me were the conditions around me. The dominant influences on me were the events that were going on around me, particularly the attack on McGurk’s bar in the New Lodge when 15 people were killed. Some of those killed would have known our family. These events took place within months of each other and they had a huge effect on Bobby. Bobby was only 16 at that time. Things were hectic in those days on the streets of Belfast with house raids and riots and Bobby’s schooling was disrupted. “These were distracting times and I left school in 1971 around the time of my 15th birthday and went to work for a while selling fruit with my father. Dad had been running a small building firm and had a contract with Belfast City Council. After the Civil Rights movement started up in 1969 the council pulled a lot of the contracts from Catholics. They took the contract from my father and he became bankrupt. By 1972, Bobby was an active republican involved in street activism and resistance against the British Army on the ground. On one occasion after an interrogation, Storey was thrown out of a Saracen armoured car on to a loyalist street. The Brits then shouted out: ‘He’s an IRA man!’ Bobby survived nonetheless. “I would be just walking up the street and the Brits would jump out and beat the f**k out of me and leave me in the middle of the street. “I wasn’t on the run because I was too young to be interned so I was more accessible and I was also six foot and easily identifiable. Bobby was arrested about 20 times before he came of age for internment. “I was interned on my 17th birthday and held in the Cages for two years in Long Kesh. “There was great comradeship in the Kesh and internment gave me the opportunity to look into Irish history, politics, the history of the IRA and the party. Storey was released from internment in 1975 and rearrested in 1976 and charged with blowing up the Skyways Hotel. He was remanded for 13 months. He wasn’t convicted but was arrested leaving the court on the day of the trial and charged with a shooting incident. They had to release him again in March 1977 as he wasn’t convicted. In August 1977, he was charged in relation to the shooting of two British soldiers in the Turf Lodge but again the charges were dropped that December. Internment was getting the British a lot of bad press so they changed tactics and used remand as a kind of internment, so even if you weren’t convicted of anything you were still imprisoned, as Bobby Storey’s experience demonstrates. “In 1978, I was charged with shooting a British soldier and again not convicted. I was remanded that time for 13 months and released in May 1979. In December of 1979, I was arrested in London and charged with conspiring to help Brian Keenan escape from Brixton Prison and conspiracy to hijack a helicopter. Yet again they couldn’t convict me and I was released in April 1981. Then, in August 1981, on the day of Michael Devine’s death on hunger strike in the H-Blocks, after a soldier was shot, I was arrested with a rifle and was sentenced to 18 years.” Two years later, in 1983, I was captured during the Great Escape when 38 POWs smashed their way out of the H-Blocks. I was given an additional seven years for the attempted escape, bringing the sentence up to 25 years. In total, Bobby Storey served over 20 years in jail, and almost all of that period was on remand on charges that failed. And right up to recent years the media and various political figures have tried, in one way or another, to undermine Storey’s political activism. Three years ago, under parliamentary privilege in Westminster, South Antrim Ulster Unionist Party MP David Burnside told the House of Commons that Bobby Storey was head of IRA Intelligence and that he was involved in the Northern Bank robbery even though absolutely no evidence exists to support that claim. Harassment, interrogation and detention have been routine in Bobby’s life – the ‘story’ of his life. Despite the constant hounding from the Brits and RUC and consecutive periods of incarceration, Bobby has some happy memories of prison and not just the burning of the Cages in 1974. For Bobby one high point was the 1983 Great Escape. Of course, there are sad memories from along the way. After his final release from jail in 1998, Bobby, as after previous releases, got reinvolved with the struggle. His work has involved developing republican politics, strategy and paving the way for the future. “Our challenge over the last decade has been to maximise our role as a movement and develop political strength. A year and a half ago, Storey became chair of Belfast Sinn Féin and it’s a big job of work. There are three comhairlí ceanntair, 18 councillors, nine MLAs and six Sinn Féin offices operating full-time as well as an MP. “I put the same application into my current work as I did in the past. As republicans we are constantly making new sites of struggle and we have to be alert and scientific in our approach. “The recession is the big issue at the moment, especially coming up to Christmas. We’ve been doing a lot of leafleting and holding conferences to inform people of their entitlements. We have a quarterly bulletin of which we distribute 60,000 copies. “This year we had the 25th anniversary of the Great Escape and the 20th anniversary of Gibraltar. The Royal Irish Regiment marched through the city centre but we stopped them from having a fly-past. This year too Sinn Féin in Belfast holds the lord-mayorship. “The Assembly is another site of struggle for republicans with the DUP, UUP and the Alliance parties lined up against us. Gradually we have been dragging unionists across, millimetre by millimetre. “We are about the decolonisation of the Orange state and it’s a mammoth task that we will not be deflected from. 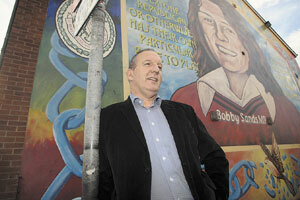 A number of people have made an impression on Bobby over the years, amongst them Che Guevara and Gerry Adams. Bobby Storey organised the Belfast part of Brian Keenan’s funeral earlier this year. Storey is a big family man. However dismissive Bobby Storey might be about his personal privations in the course of over 30 years of struggle, he is in no way flippant about his determination to see the republican project through. “No matter whether I was in or out of jail, it was all the same struggle if with different styles of struggle. Republicans are about getting a united Ireland and there’s no reason to stop struggling until we achieve that.